At the blue door: Ha! Missed me by a mile! Most adults will admit to being terrified by the flying monkeys in the Wizard of Oz, but fewer people seem to remember the apple trees. When I was little I knew about apple trees. At this time of year my family would visit orchards and cider mills. Sometimes we'd pick apples from abandoned trees growing along fence rows. 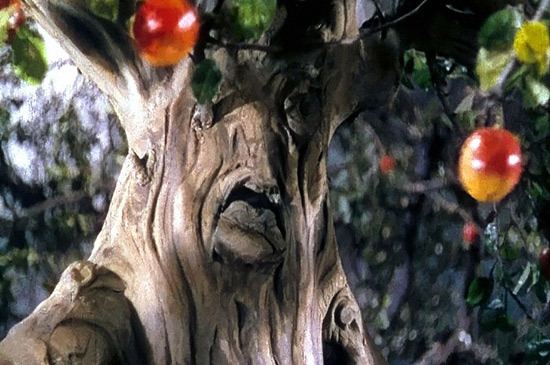 Imagine my horror when I was very small and watching The Wizard of Oz for the first time and learning that the grown-ups had forgotten to tell me that the apple trees might be tetchy about having their apples picked! But I'm glad to say I coped, have always liked apples, and have planted apple trees just about every place I've lived. My apple trees are largely sweet-tempered, providing the loveliest blossoms in the spring. At this time of year they're finishing up dropping their crop of apples, and if I happen to be walking under one of them when an apple lets go, well, I don't take it too personally.